Content Management Systems, or CMS, are an excellent choice for companies or organizations with numerous updates each month. WebWise Design & Marketing will create your website, customizing a CMS framework, and will train you, or whomever you designate, in using the the easy-to-use, content management system. It is as simple to use as a WYSIWYG word processor. You control the content and make updates when it fits your schedule. Of course, we will be there to offer technical support as needed. 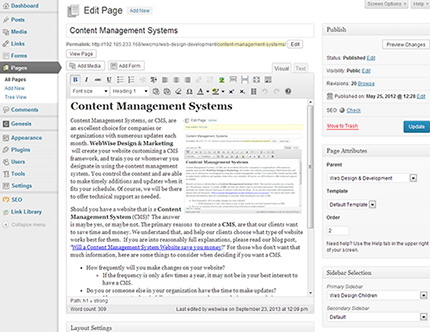 Should you have a website that is a Content Management System (CMS)? The answer is maybe yes, or maybe no. Saving time and money are the primary reasons to create a CMS site. We understand that, and we help our clients choose what type of website works best for them. If you are into reasonably full explanations, please read our blog post, “Will a Content Management System Website save you money?” For those who don’t want that much information, here are some things to consider when deciding if you should have a CMS. How frequently will you make changes on your website? If the frequency is only a few times a year, it may not be in your best interest to have a CMS. Do you or someone else in your organization have the time to make updates? If everyone’s plate is full, you may want to leave updating your website to us. Do you feel comfortable writing search engine friendly copy for your website? Do you feel comfortable sizing and optimizing photos and other images you would like on your website? Did you know? We can add ecommerce shopping features to any of our CMS websites. Everything we do at WebWise Design & Marketing is done with you in mind, so please talk with us about whether or not a Content Management System website is the right solution for you.